The SN74HC74 (7474) integrated circuit provides two independent D-type flip flops in a single package. The flip flop is triggered on the positive edge of a clock pulse. At the moment the clock pin (CLK) goes high, the state of the data pin (D) is captured and held as the output (Q). Q will not change again until the next time the clock rises, regardless of how long the clock stays high, or any further changes to D.
The device does include preset and clear inputs that will drive Q either high or low respectively, but they are not used in this demonstration. Preset and clear are activated by a low signal and therefore are tied to Vcc to keep them pulled high. The device also includes a negative output (not Q) which is always the opposite of Q. It is not used in this demonstration. 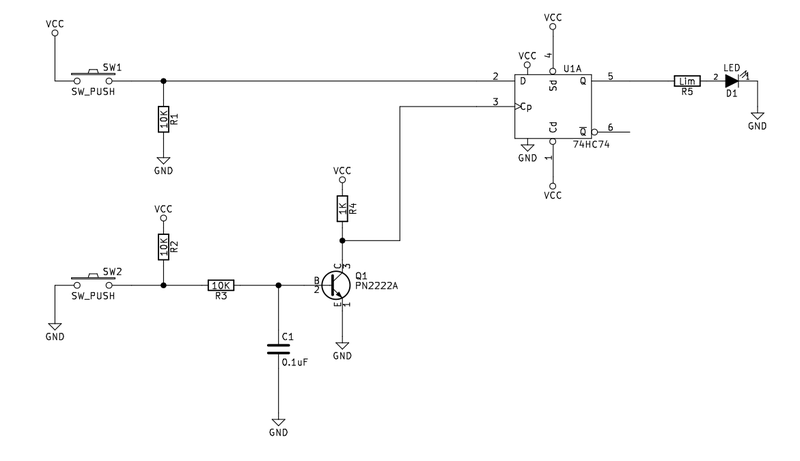 The SN74HC74 is relatively straightforward to use in this manner, all that is required are clock and data signals. However, because the flip flop is tied to the specific rising edge of the clock signal, it is extremely sensitive to noise. In this demonstration where a mechanical switch is used rather than a true electronic clock signal, it is absolutely necessary to include circuitry to clean up the bounce and other noise generated by the switch. 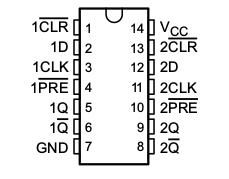 The clock input is labeled as SW2 in the schematic and is the far left switch in the breadboard diagram. Between the switch and the IC input, the signal passes through a resistor capacitor filter and a transistor inverter which debounces and conditions it for correct operation. The circuit was built and tested at 4.8 volts DC (4 AA NiMH rechargeable batteries). The 74HCxx series ICs are rated from 2 to 6 volts.